Pulling out the sweaters and boots that have been wrapped up since Spring and planning new cold weather outfits. Rain. It's going to rain this weekend and I can't wait! 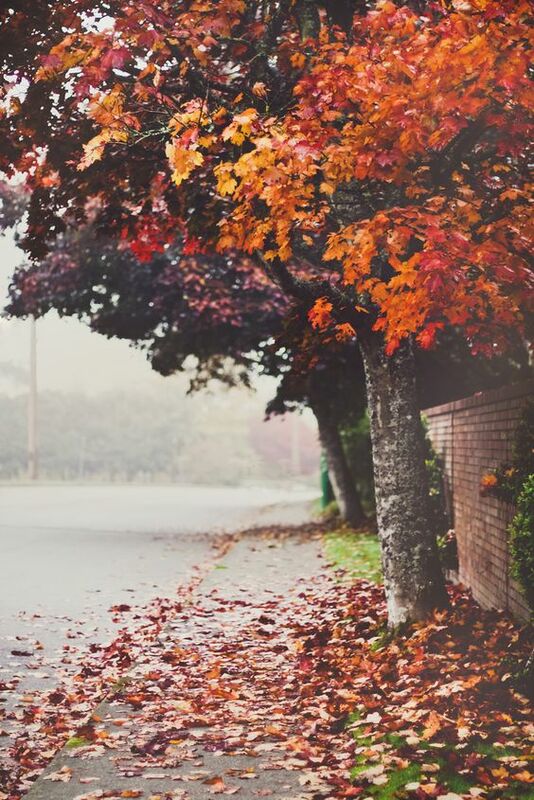 Turning leaves in gorgeous colors and crunching them under my feet when they fall. I always find a few beauties to press in my journal. I am way more inspired to write in the fall. Summer is a dormant soul-creative time for me, but fall is when I wake up again. Instead of iced coffee I can get a hot drink from Starbucks. Halloween. The house is already decorated with little pumpkin heads! Watching scary movies the whole month of October (love to be a little spooked!). Knowing Christmas is around the corner. The house being cool and putting extra cozy comforters on the bed. Waking up first thing and putting on slippers and my favorite fuzzy cardigan. The sun shining at a different angle, creating new shadows and peace for me. I get extra romantic in the Fall and want to slow dance with Ronald in our living room. The house stays cool when I bake. All Summer it would make the house swelter. Today I'm going to make chocolate fudge cookies. Drinking bourbon is all the more satisfying when it's cold out, and Ronald makes some amazing whiskey cocktails with honey and cinnamon sticks. Painting my nails black and oxblood. Wearing dark red lipstick, dolling up and feeling sultry. Making comfort food and finding new cold-weather recipes to try. Dressing the pups up on Halloween. We usually have a Batman, and Harry as a taco! Going to the craft store and getting so excited about crafts that I never end up doing. Wearing my new plaid wool skirt with tall lace up boots. Tights from We Love Colors. How beautiful nature's decay is and the promise that it will all return anew in the Spring.